Still, it took about 1hr 50m, so I'm happy enough. 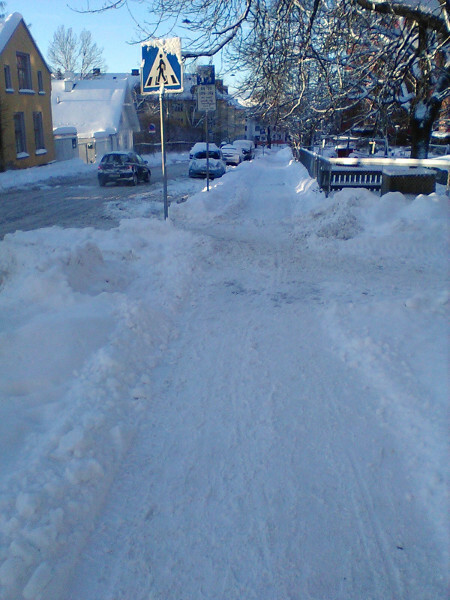 The only photo I took was outside my flat when I finished - I figured if I stopped halfway, I'd find it hard to start again! 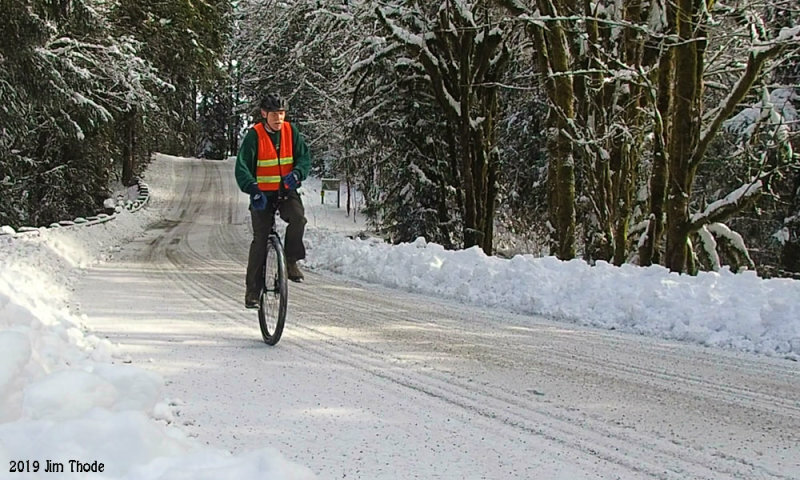 It is “Winter Bike to Work Day” so I figured I would do it on a unicycle. 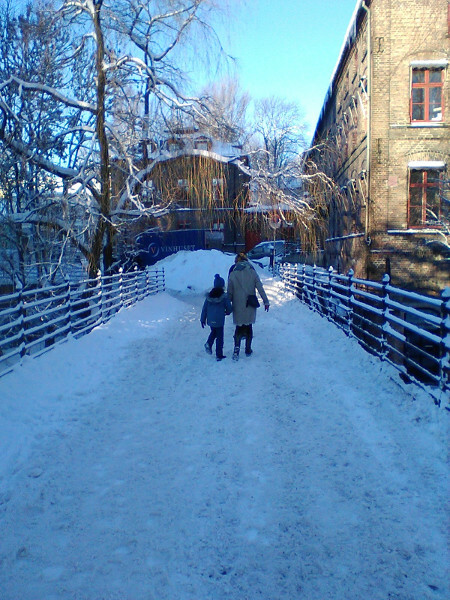 At the last minute it occurred to me to take a few pictures but I generally do not carry a smartphone, so I am afraid these are not the highest quality, having been taken with a 2MP camera on a basic feature phone. I have also resized them down. Nonetheless here is a selection from the commute I do pretty much every day (well one of my two routes anyway). 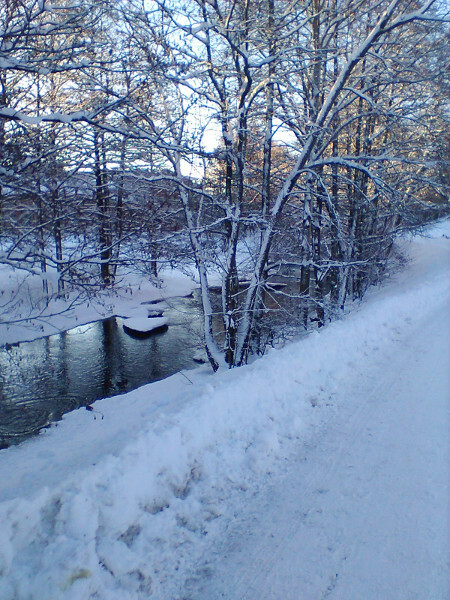 Olso is looking pretty nice today and the paths and roads were pretty well maintained. A “selfie” for the sake of it. It's actually pretty hard to do. 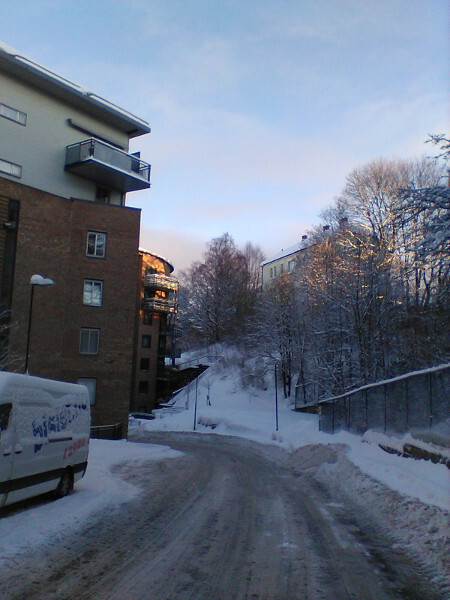 Not because of the snow/ice (as you can see it is pretty clear) but mainly holding the phone in reverse (only a backwards camera) and trying to line it up and time it. That is an interesting unicycle wilson109 but it appears you left the training wheel on. I also took my uni today for Winter Bike To Work Day. I managed to take two selfies. One off- and one on-board. Kudos! Great looking ride. I must admit I am a warm weather rider. Can I ask what kind of mask you are wearing? As a respiratory therapist it looks like something many of my patient could use. Interesting mask. Looks like an anti-pollution mask for cycling. 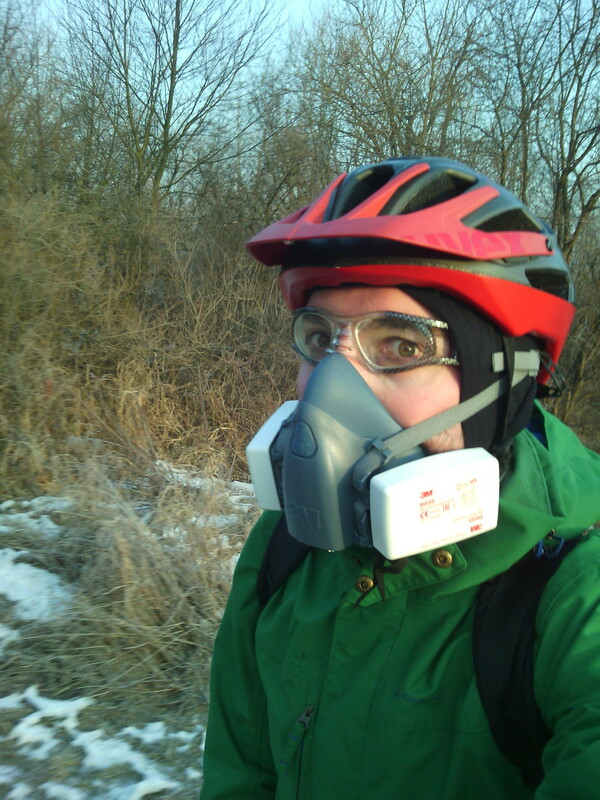 I don't know about the specific brand but if you do a Google search for "anti-pollution masks for cycling" you will find a bunch for sale and reviews and such. jlin and JimT, yep this is a air-pollution mask. The air pollution topic has gone so big in Krakow, Poland that you can buy one in almost every supermarket and there is a number of local brands. This one is one of them - Citymask, quite nice disposable sports mask. Good to try if it is something for you. Just try to take one with a valve and P3 filtering class (out of P1-P3 scale). 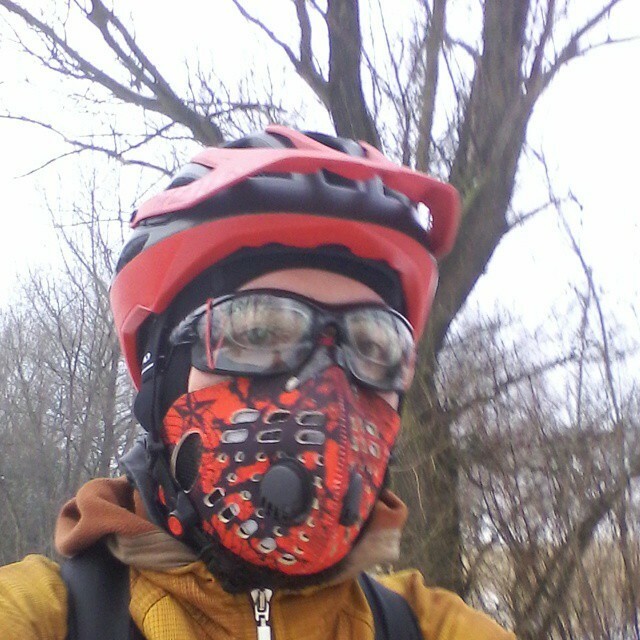 Then after making sure that I will ride in a mask when the air is dirty, I decided to take the sports mask. 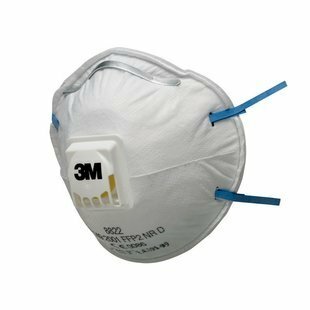 I selected RZ Mask as it was half the price of Respro masks. It was OK, but remember you'll never be fully comfortable in the mask as breathing is much harder than normally and glasses go foggy quicker. Out of this mask type I've heard very good opinions about Respro masks and especially Respro Cinqro, but the price when I was buying mine was too high for me. Tragic air two years ago made me try industrial model by 3M . This is heavy duty stuff with possibility to attach various filters depending on conditions. The big gain with this one is that fog on the glasses is limited compared to the other ones. Since then I haven't bought new filters to my quite used RZ mask and I'm using my disposable mask you've seen on the first picture when air is mediocre while using the heavy duty one when it is disastrous. Luckily not that often recently. Last edited by vookash; 2019-02-09 at 08:26 PM. Why the respiratory mask? For the cold air or pollution? Unfortunately pollution. It has gone bit better last two years, but still we have days when we hit famous Beijing levels of dust in the air. 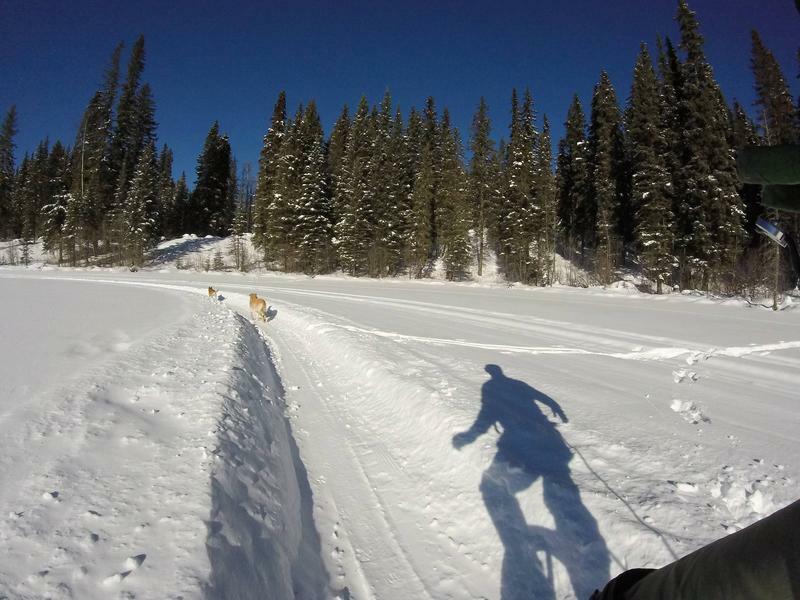 Thanks to the local fat bike crowd we have 10kms of groomed fat bike trails. If I keep my speed up and don't stray too far from centre it's very rideable with my 3 1/4" tire. 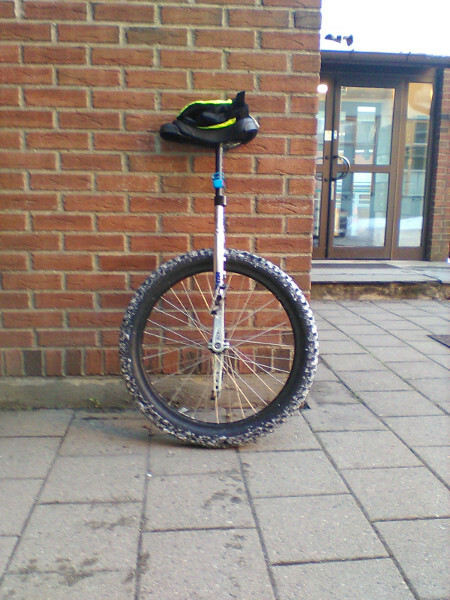 that must be very annoying when unicycling. After a short ride I already sweat like a pig and need my oxygen. That is a pity vookash. Jammer also Setonix...maybe your heart. If you are solid like me, ... we sweat, but seriously get it checked mate. @aspenmike I presume that is a Nightrider tyre? How do you find it in the snow? I must admit I have never tried cycling my 36’er in the snow. The lack of tyre options put me off. I imagined the that small gaps between the tread on the Nightrider would get rapidly filled with snow and I would prefer have spikes to deal with icy patches. As I don't think AspenMike answered, I thought I would offer my experience. 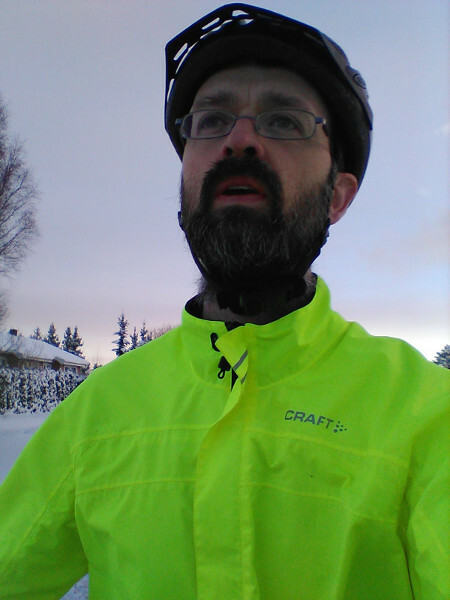 This winter not been riding the 36 much, but the previous 2 winters I commuted 16km x2 on my 36 with quite a few snow and ice days. First: in general the Nightrider tire is amazingly way grippier than one would think (also true for muni). And with the width you can lower the pressure a bit in snow/ice. However, it obviously reaches it limits way faster than a nobby tire. My ghetto-solution that I did the last 2 winters was to put zip-ties all around the tire: I think I did 2 per spoke. This seems to help quite a bit both on snow and on ice, especially with a little speed. Although of course still not close the grip of spiked tires or really aggressive tread. In particular, as the zip-ties are only secured around the tire, the are almost completely perpendicular to the rolling direction. This means you have zip-tie, rubber, zip-tie, etc. such that is you have a sudden force (turn or mount or stop), then it may by chance hit between the zip ties. Anyhow, I found it worth it. For a 3-month winter of about 3x 16x2 commuting/week I ended up replacing about half of the zip-ties, but the total cost was ok and cheaper than buying a spike tire (if there is even one for 36). In deeper snow, the Nightrider is pretty much useless and nothing compared to my 29+ DHR-II 3" but then that's just a way different tire. With the recent snow in the NW US been riding some. 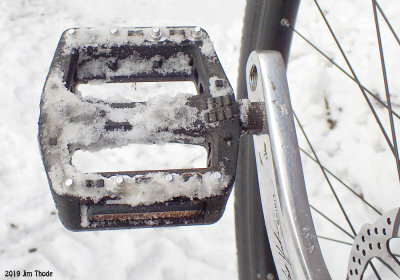 I have more of an issue with snow/ice on the pedals then the slippery road surface. 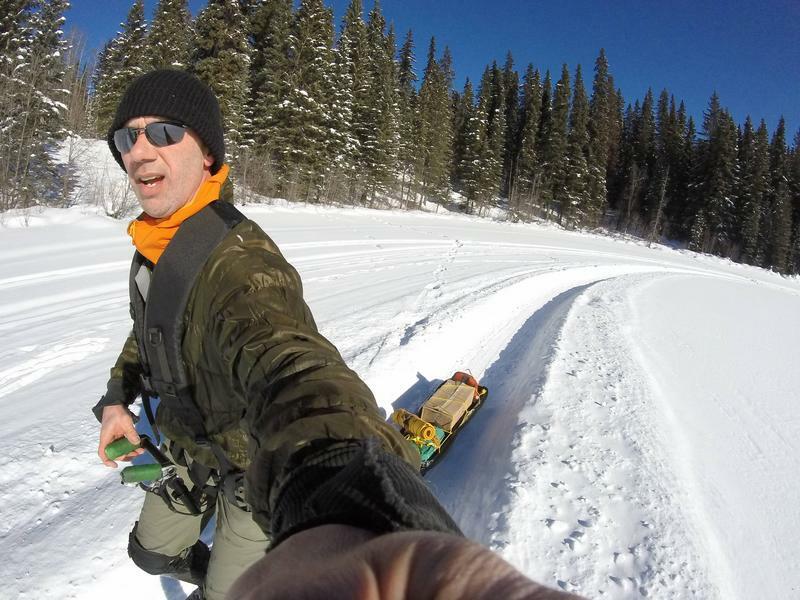 Pulling a pulk loaded with a tipi and wood stove. Me riding what looks like an ultimate wheel.